As a kid, I was never a fan of dates. Just a few years ago I decided to give them another try…I couldn’t believe how wrong I was! One bite into the sweet, rich fruit, and I was changed into the biggest date-lover out there. While I usually eat a couple of them after dinner as a sweet treat, I like to come up with different ways to incorporate them into my cooking as well. 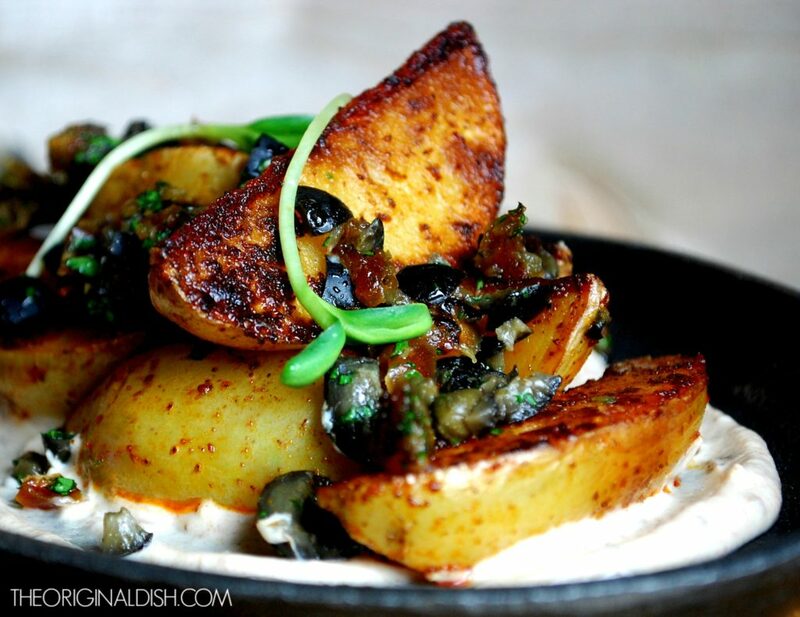 This dish takes potatoes to a whole new level, and it uses dates to do so. 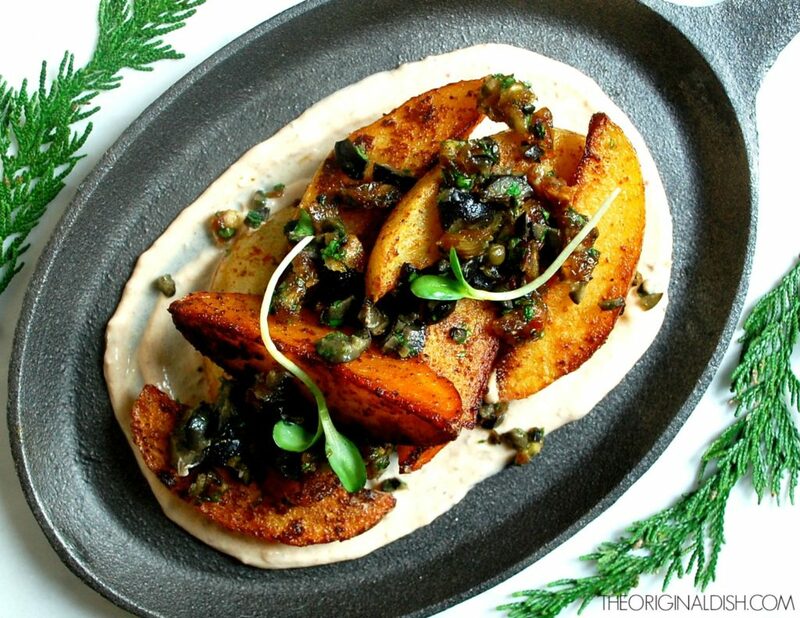 Potatoes, like many starch side dishes (pasta or rice), are blank canvases ready to take on any flavor you give them. I start by cutting the potatoes into thick wedges. This cut leaves you a thick bite of potato with seared flavor on each side. Once cut, I toss the wedges with smoked paprika to spice them up a bit. The paprika infuses them with its bright red-orange color, making them even more beautiful when seared in hot olive oil. Searing crisps them up and creates dark, golden edges on every wedge. They’re finished cooking in the oven just until the potatoes are tender, but still firm. 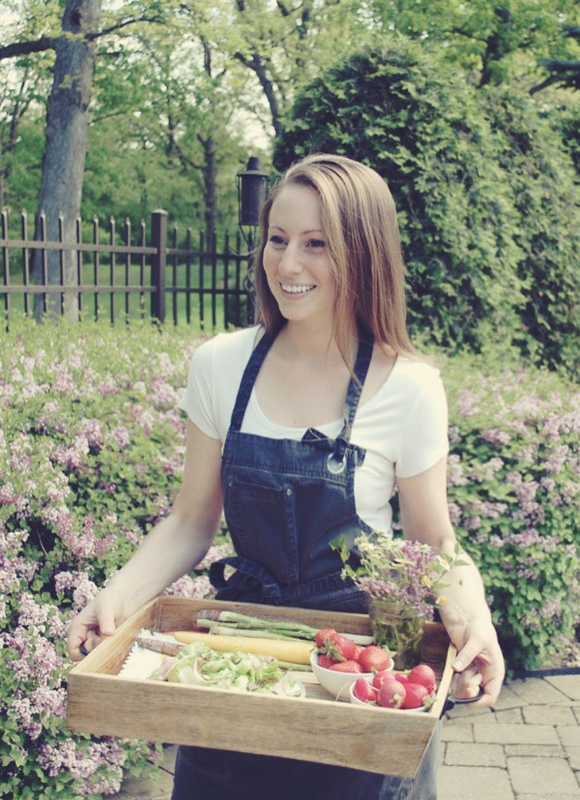 You don’t want them to fall apart when you serve them. A squeeze of lemon brightens them up and gives the dish a citrusy bite. To add more layers of flavor to the potato wedges I make two other components, both involving dates. The first is an olive-date tapenade. I was inspired to make a tapenade because I thought it would go great with the smoky paprika. Tapenade is a traditional Provencal dish usually served as a spread. I make it as a topping and while there are many traditional ingredients, I give it a sweet touch by using finely chopped Medjool dates. The dates are mixed with olives, capers, lemon and parsley. The finishing touch: a splash of rich and delicious olive oil. 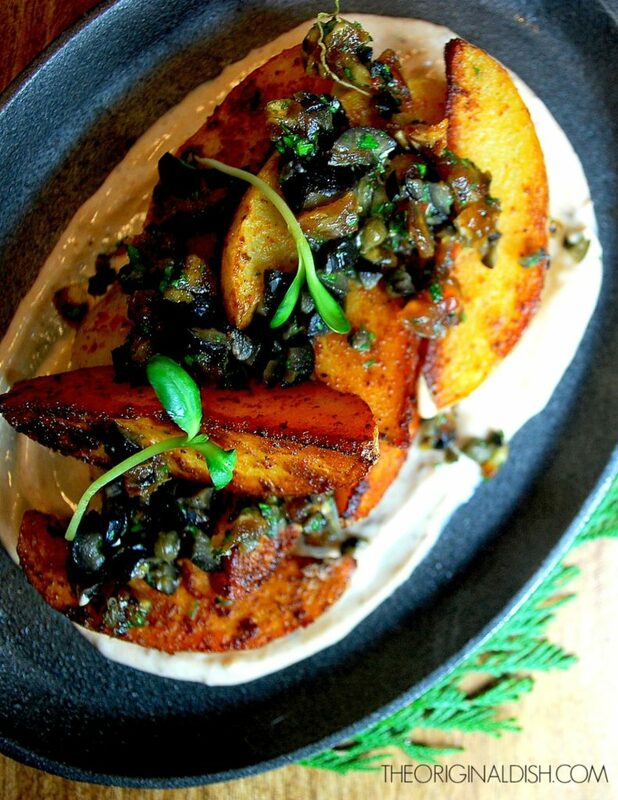 This tapenade is served over the potato wedges, creating a sweet, smoky, salty combination. Now all the dish needs is a little creaminess! Sour cream and potatoes are a classic duo, so I figured I’d keep that combination but add a little twist. To carry on the date flavor that’s in the tapenade, I create a date puree to whisk into the sour cream. The puree is extremely simple to put together. I start by reducing the dates in cream sherry until they are infused and soak up most of the liquid. This mixture is cooled and blended until a smooth puree forms. The puree plus sour cream and a little seasoning is all you need to create an intriguing dip for the dish. I usually spread the date sour cream onto a plate before piling up the potatoes and spooning the tapenade over the top. Enjoy! Combine the dates and cream sherry in a small saucepan. Bring the sherry to a boil, lower the heat, and simmer for about 25-30 minutes until the dates have absorbed most (but not all) of the sherry. Let the mixture cool. In a food processor, blend the cooled date mixture until smooth. In a mixing bowl, combine 3 ounces of the date mixture with the sour cream, salt and pepper. Whisk until smooth. Refrigerate until ready to serve. Preheat the oven to 350°F. 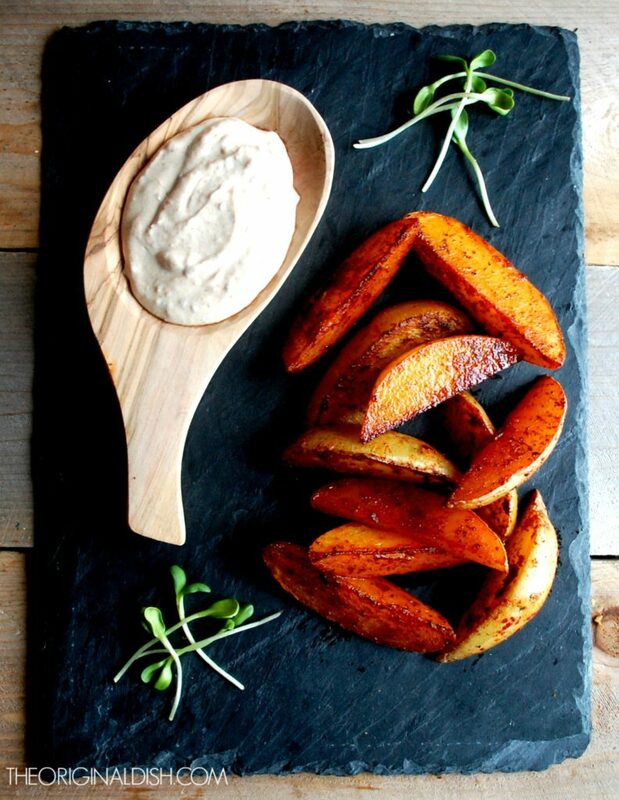 In a mixing bowl, toss the potato wedges with the paprika, salt and pepper. Make sure each wedges is coated with paprika. Heat the olive oil in a large pan over medium-high heat. When the oil is sizzling hot, add the potato wedges (you may need to work in batches; you don’t want to overcrowd the pan). Lower the heat to medium and sear the potatoes until golden brown, a few minutes per side. Transfer the pan to the oven to finish cooking the potatoes, about 10 more minutes. 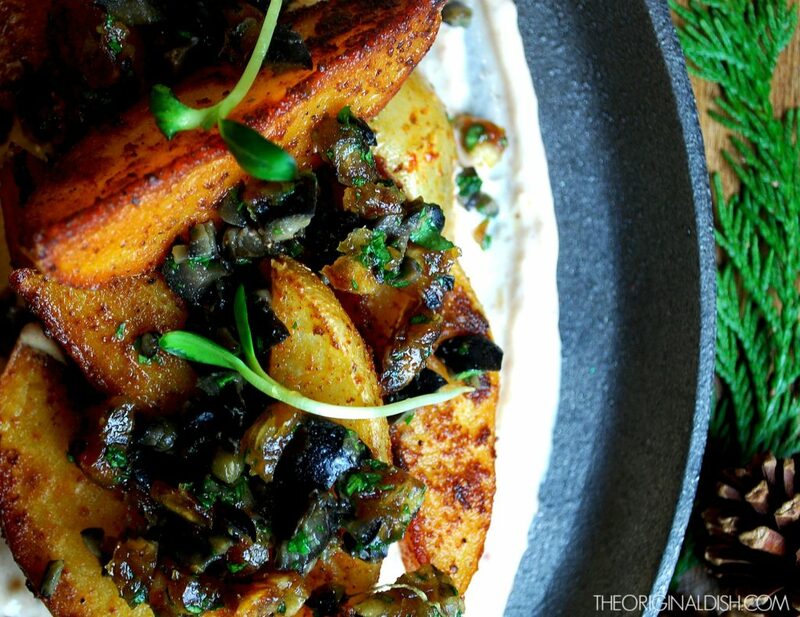 Squeeze the lemon over the potatoes as soon as they come out of the oven. 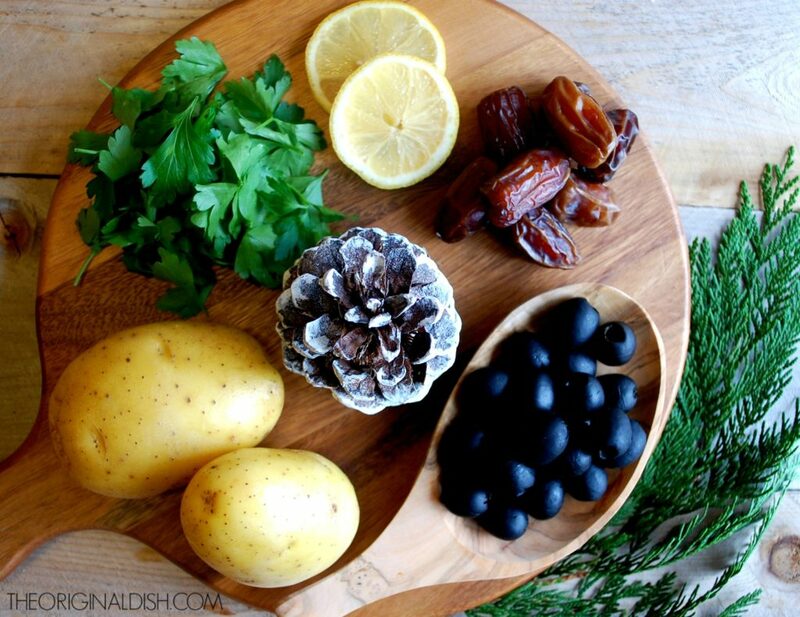 Combine the dates, olives, capers, lemon juice, lemon zest, parsley, olive oil, salt and pepper in a mixing bowl. Mix to incorporate. Spread the date sour cream on a plate. 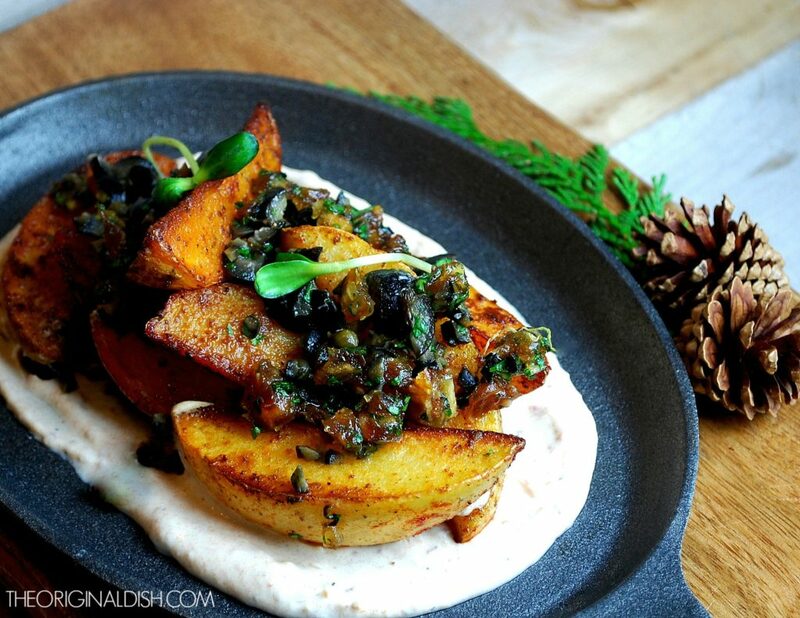 Place the potato wedges on the plate and spoon the olive-date tapenade over the top. 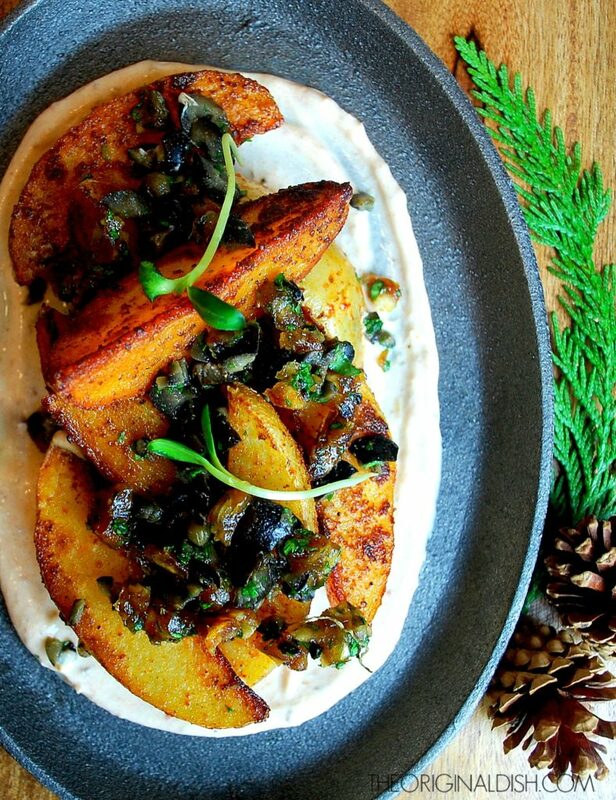 Alternatively, serve the date sour cream in a bowl with the tapenade on top and potato wedges alongside. To lighten this dish up, try Greek yogurt instead of sour cream. You also will have extra date puree. Save this to flavor other dishes or to make the sour cream again. You can freeze it if needed. Another winner Kayla. I love dates and this sounds delicious and linked to the potatoes . True genius; . Cannot wait to try this one. Yes you must try! It’s a great, different ways to use dates. Gorgeous presentation. Love the date sour cream.